The largest study to correlate genetics with response to cancer drugs releases its first results today. The researchers behind the study, based at Massachusetts General Hospital Cancer Center and the Wellcome Trust Sanger Institute, describe in this initial dataset the responses of 350 cancer samples to 18 anticancer therapeutics. These first results, made freely available on the Genomics of Drug Sensitivity website, will help cancer researchers around the world to seek better understanding of cancer genetics and could help to improve treatment regimens. “Today is our first glimpse of this complex interface, where genomes meet cancer medicine,” says Dr Andy Futreal, co-leader of the Cancer Genome Project at the Wellcome Trust Sanger Institute. “We will, over the course of this work, add to this picture, identifying genetic changes that can inform clinical decisions, with the hope of improving treatment. How a patient responds to anticancer treatment is known to be determined in large part by the combination of mutations in her or his cancer cells. The better this relationship is understood, the better treatment can be targeted to the particular tumour. The aim of the five-year, international drug-sensitivity study is to find the best combinations of treatments for a wide range of cancer types: roughly 1000 cancer cell lines will be exposed to 400 anticancer treatments, alone or in combination, to determine the most effective drug or combination of drugs in the lab. The therapies include known anticancer drugs as well as others in pre-clinical development. 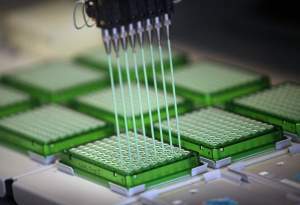 To make the study as comprehensive as possible, the researchers have selected 1000 genetically characterised cell lines that include common cancers such as breast, colorectal and lung. Each cell line has been genetically fingerprinted and this data will also be publicly available on the website. Importantly, the researchers will take promising leads from the cancer samples in the lab to be verified in clinical specimens: the findings will be used to design clinical studies in which treatment will be selected based on a patient’s cancer mutation spectrum. The new data released today draw on large-scale analyses of cancer genomes to identify genomic markers of sensitivity to anticancer drugs. The first data release confirms several genes that predict therapeutic response in different cancer types. These include sensitivity of melanoma, a deadly form of skin cancer, with activating mutations in the gene BRAF to molecular therapeutics targeting this protein, a therapeutic strategy that is currently being exploited in the clinical setting. These first results provide a striking example of the power of this approach to identify genetic factors that determine drug response. “It is very encouraging that we are able to clearly identify drug–gene interactions that are known to have clinical impact at an early stage in the study,” says Dr Ultan McDermott, Faculty Investigator at the Wellcome Trust Sanger Institute. “It suggests that we will discover many novel interactions even before we have the full complement of cancer cell lines and drugs screened. Further results from this study should, over its five-year term, identify interactions between mutations and drug sensitivities most likely to translate into benefit for patients: at the moment we do not have sufficient understanding of the complexity of cancer drug response to optimise treatment based on a person’s genome. The comprehensive results include correlating drug sensitivity with measurements of mutations in key cancer genes, structural changes in the cancer cells (copy number information) and differences in gene activity, making this the largest project of its type and a unique resource for cancer researchers around the world. The Genomics of Drug Sensitivity project was launched in December 2008 with funding from a five-year Wellcome Trust strategic award. The UK–US collaboration harnesses the experience in experimental molecular therapeutics at Massachusetts General Hospital Cancer Center and the expertise in large scale genomics, sequencing and informatics at the Sanger Institute. The scientists will use their skills in high-throughput research to test the sensitivity of 1000 cancer cell samples to hundreds of known and novel molecular anticancer treatments and correlate these responses to the genes known to be driving the cancers. The study makes use of a very large collection of genetically defined cancer cell lines to identify genetic events that predict response to cancer drugs. The results will give a catalogue of the most promising treatments or combinations of treatments for each of the cancer types based on the specific genetic alterations in these cancers. This information will then be used to empower more informative clinical trials thus aiding the use of targeted agents in the clinic and ultimately improvements in patient care. Project leadership includes Professor Daniel Habers and Dr Cyril Benes at Massachusetts General Hospital Cancer Center and Professor Mike Stratton and Drs Andy Futreal and Ultan McDermott at the Wellcome Trust Sanger Institute. The Wellcome Trust Sanger Institute, which receives the majority of its funding from the Wellcome Trust, was founded in 1992 as the focus for UK sequencing efforts. The Institute is responsible for the completion of the sequence of approximately one-third of the human genome as well as genomes of model organisms such as mouse and zebrafish, and more than 90 pathogen genomes. In October 2005, new funding was awarded by the Wellcome Trust to enable the Institute to build on its world-class scientific achievements and exploit the wealth of genome data now available to answer important questions about health and disease. These programmes are built around a Faculty of more than 30 senior researchers. The Wellcome Trust Sanger Institute is based in Hinxton, Cambridge, UK. The Wellcome Trust is a global charity dedicated to achieving extraordinary improvements in human and animal health. It supports the brightest minds in biomedical research and the medical humanities. The Trust’s breadth of support includes public engagement, education and the application of research to improve health. It is independent of both political and commercial interests.